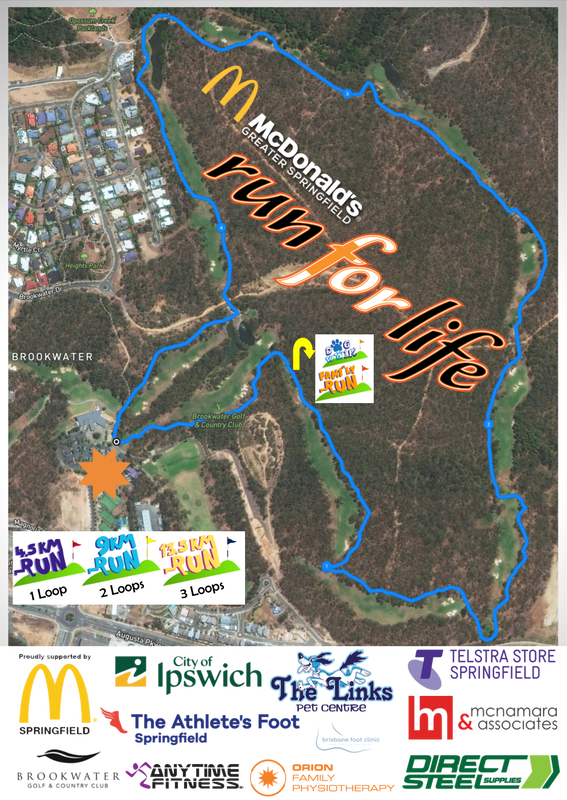 The ‘McDonald's Greater Springfield Run for Life’ to be held at Brookwater Golf & Country Club. It is beautiful parkland that offers a world-class recreational area with its five kilometres of walkways and boardwalks and a tree top walk through a stand of native eucalypts, zero-depth wet play area, all-ability play equipment, walking trails and cycling paths the park has everything to hold an international event. The ‘McDonald's Greater Springfield Run for Life’ (originally under the name Run for Fun and Sonsation Run) has been the region’s premier community sporting event for 20 years. This event brings together the community, corporate bodies, athletes and families from all around South East Queensland and interstate. All parties experience a fun filled morning while helping to raise funds, which inject life into our community. Each year, the McDonald's Greater Springfield Run for Life strives to raise between $10,000 to $20,000 for local and state charities including Westside Community Care, Scripture Union and local Chaplaincy services along with other participating beneficiaries. Organisations or companies who participate by entering teams or individuals into the 9k and 13.5k have the opportunity to fundraise for a charity of their choice.